I am very pleased to announce that Episode One of The Spectre is available for pre-order. Links for Amazon US and UK are live. The episode is approximately 16,150 words, so that equals out to roughly 64 pages. It is scheduled to be released on March 3rd. In November of 1995, the Maxwell family was thrown into a fight for their lives against a malevolent entity that haunted their home. They barely escaped. Now, in 2003, a fledgling production company stumbles across the ruin of the farmhouse on Gore Road. Heather Green, a young production assistant, is tasked with investigating the haunting so that a television special can be made from it. However, as Heather delves into the history of the property, strange things begin to happen. Footsteps follow her around during her overnight shifts at the studio. Disembodied voices mess with her head. It is soon apparent that something from the dark past of the farmhouse has awakened and is targeting her. Heather tries to leave her problems at work, but when the unseen forces follow her home, she begins to realize that she is fighting a force that is much more insidious than she imagined. This is the continuing story of The Entity. While out on a shoot for the television show Haunted Happenings, Heather breaks off from the team to film an old, destroyed farmhouse in the woods. When she returns home, strange and unexplainable things begin to happen. I’m busy at work on the second episode in the series, and I finally feel like I have a good grasp of the characters. Like all my stories, they start off in my head as just glimpses, then they solidify after a while and start telling me what they want. What horrors are in store for Heather and Eddie? You’ll have to read to find out! Look for an exclusive excerpt on this blog as it gets closer to the release date. At the same time, I am always looking for some reviews. Those are tricky things to get. 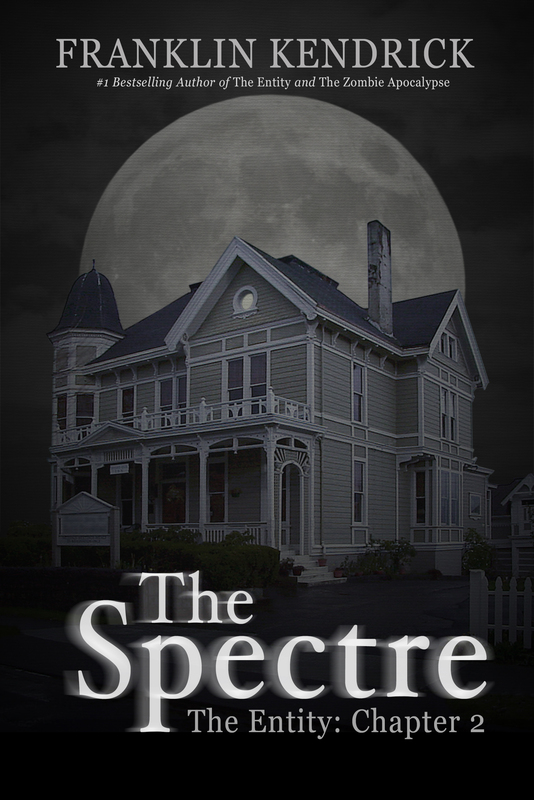 If you read any of my first series, The Entity, and would like to get a review copy of Episode One of The Spectre, email me a link to your review on Amazon and I can send you along an advanced copy of the Kindle book. My email is franklinkendrickauthor@gmail.com. I look forward to hearing from anyone who enjoys a good ghost story! With all that said, Happy Friday, everyone!